You may want to put out the cigarette. Back pain is one of the most common medical problems in the United States, affecting 8 out of every 10 Americans at some point in their lives. A major part of that population smokes tobacco. According to the newest studies, smokers are three times more likely to develop chronic back pain than nonsmokers (Whiteman 2014). Not only does smoking affect the anatomy of your back, but it also can change the way the brain relates and responds to pain. 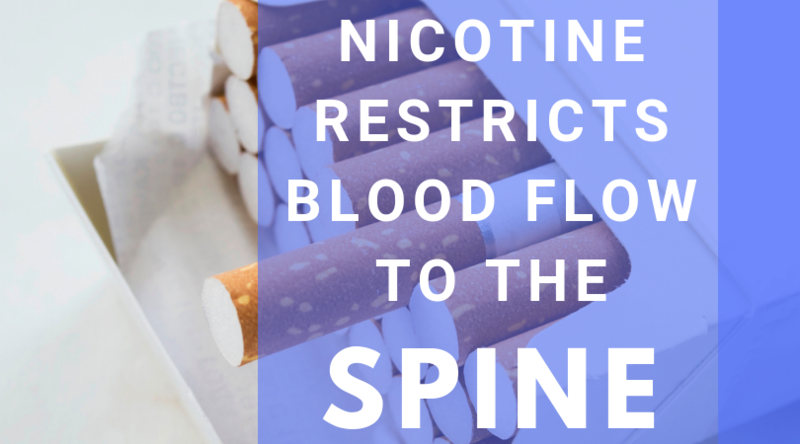 Nicotine, the addictive component of a cigarette, restricts blood flow to the spine, including the discs between vertebrae. These discs act as shock absorbers between the bones of your spine. With reduced blood flow, the bones and discs degenerate more quickly. This loss of cushioning between bones leads to back pain. Nicotine also reduces the rate of calcium absorption, which is necessary to grow new bone. With this decreased bone growth, a person who smokes is at risk of osteoporosis (brittle, fragile bones), fractures, and slower healing. In addition, those who smoke often experience a “smoker’s cough.” These repeated coughing spells can also cause spine pain from repeated jerky motions of the neck and back with each cough (“Low Back Pain Fact Sheet | National Institute of Neurological Disorders and Stroke,” 2014). minds of smokers, these two areas have stronger connections, demonstrating that those who smoke are more susceptible to experiencing episodes of pain. However, when people voluntarily stop smoking, the communication between these two parts of the brain decrease. Therefore, the risk of chronic back pain is increased in those who smoke compared to those who do not (Whiteman 2014). If you or someone you know experiences chronic back pain and smokes tobacco, we encourage you to visit your primary care provider for smoking cessation programs or other behavioral interventions that may help kick the habit. While quitting smoking can help to reduce the amount of pain you are experiencing, you may also need to consider surgery in order to fully treat your condition. Contact International Spine Institute to learn more about your options for back pain relief & schedule your consultation today.